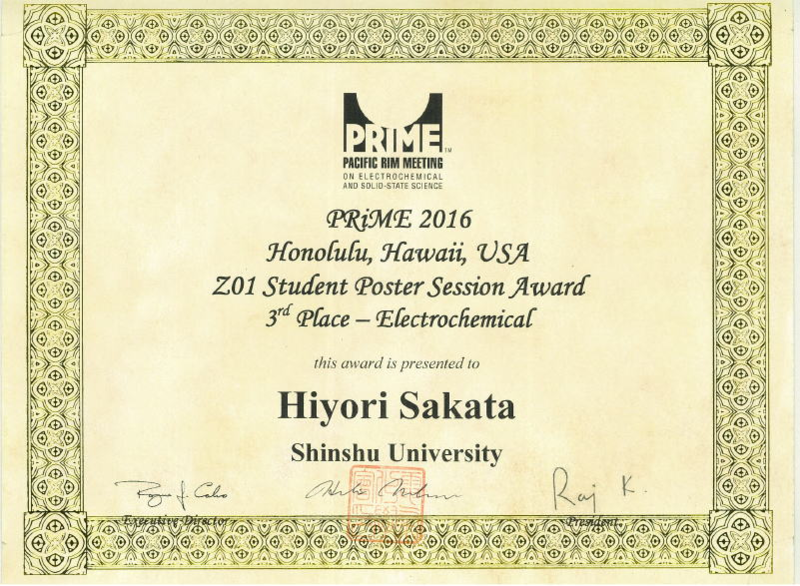 First-year master's course student Hiyori Sakata of the Graduate School of Science and Technology, Division of Chemistry and Materials (Wataru Sugimoto Laboratory) received the Student Poster Session Award (third place in the "Electrochemical" category) at the Pacific Rim Meeting on Electrochemical and Solid-State Science 2016 (PRiME 2016), which was held from October 2 to 7 in Honolulu, Hawaii (USA). Her winning work was entitled Dual electrolyte hybrid supercapacitor using liquid-liquid interface. Held once every four years, PRiME is the largest electrochemistry-based international conference. PRiME 2016 drew more than 4,000 attendees. 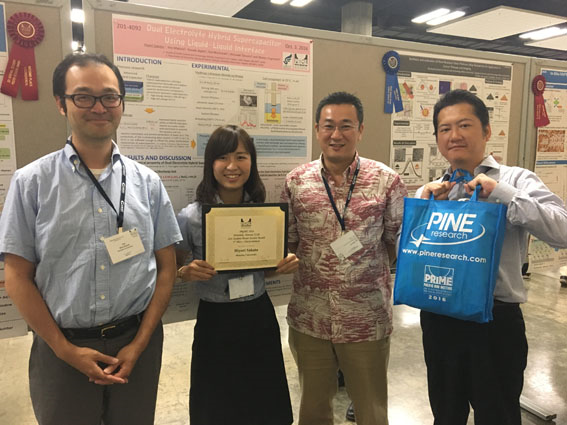 Sakata's poster was selected from among the 210 student poster presentations held at the conference—hers was only one of five honored with awards. Research Overview: Sakata's research reports a new hybrid supercapacitor utilizing liquid-liquid interface between an aqueous electrolyte and an ion liquid. A ruthenium oxide cathode is used with Li2SO4 electrolyte as the catholyte, and combined with a Li anode in LiTFSI-PP13TFSI anolyte. This cell has a maximum cell voltage of 3.8 V and has lower resistance than previously developed aqueuos hybrid capacitors with protected Li anode. This unprecedented liquid-liquid interface hybrid device can be anticipated to out perform existing hybrid supercapacitors and has a potential as post lithium-ion battery technology.